Rock The Body Electric: Dylan Cover #335 Old Crow Medicine Show "Stuck Inside A Mobile With The Memphis Blues Again"
Dylan Cover #335 Old Crow Medicine Show "Stuck Inside A Mobile With The Memphis Blues Again"
In this ongoing Monday Series we will be exploring various artists versions of Bob Dylan song's. Today's artists, Old Crow Medicine Show doing a live cover of "Stuck Inside A Mobile With The Memphis Blues Again"
Certain months RtBE has a special focus during our Dylan Covers series. Sometimes it is harder, sometimes it is softer. Sometimes it is jazzy and then each April we get ready for the upcoming Jazzfest, which isn't always jazzy. 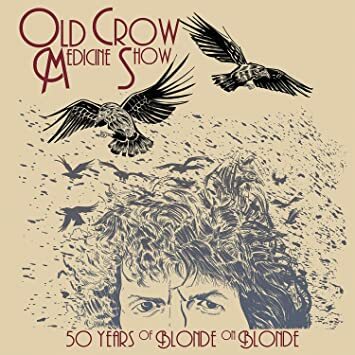 This month it's the Old Crow Medicine Show's live celebration, 50 Years of Blonde on Blonde. A beast of a track and perhaps one of the true "Wild Mercury" songs from the classic album as it mixes tempos, wild descriptive passages and excellent musicianship into a really unique gumbo. The track has never been my favorite from Blonde on Blonde, and it is really The Grateful Dead who we heard it from first. RtBE had a bunch of their 80's tapes before we dove in with both feet to Dylan...kinda like what we did with this Monday series in the early days of the site. The rambling passages, the stoned punched out sound and Dylan sounds a bit mad (as in crazy) on the album take, but the best ones always are. The closest I ever got to the sound I hear in my mind was on individual bands in the Blonde on Blonde album. It's that thin, that wild mercury sound. It's metallic and bright gold, with whatever that conjures up. 50 Years of Blonde on Blonde was recorded live at the CMA Theater at the Country Music Hall of Fame, in Nashville, Tennessee, in May 2016. The concert coincided with a Hall of Fame exhibit exploring Dylan's time in Nashville.In an interview, band members Ketch Secor and Critter Fuqua described how they had bonded over Dylan's songs as teenagers, and that the 50 Years... project was a natural extension of that collaboration. While the new recording follows the sequence of Dylan's original track-for-track, Old Crow took considerable liberties with the arrangement of individual tracks. The recording was released as an album on April 28, 2017. It was the band's first release on their new label, Columbia Records, which had released Dylan's original album in 1966. This cover is the best the band has done for our focus this month, it fits them so well and we were happy to have had this celebration of Dylan to focus on for July 2018. "Fifty years is a long time for a place like Nashville, Tennessee. Time rolls on slowly around here like flotsam and jetsam in the muddy Cumberland River. But certain things have accelerated the pace of our city. And certain people have sent the hands of the clock spinning. Bob Dylan is the greatest of these time-bending, paradigm-shifting Nashville cats."